Heather Smith-Porter and her Lil Joe Tag dominated non-pro action at the CRHA Slide on the Beach with five titles. HUNTINGTON BEACH—The California Reining Horse Association Slide on the Beach, the club’s third in a four-event season, brought to life the Huntington Beach Central Park Equestrian Center Aug.4 for a one-day show. Although not a National Reining Horse Association Affliate qualifier, this show is a popular one that brings out top competition to a different venue. Non Pro competitor Heather Smith-Porter and Lil Joe Tag (Whiz N Tag Chex X Katie Jo Fritz) were among them, as Smith-Porter took her gelding to titles in four classes—Non Pro, Intermediate Non Pro, Prime Time Non Pro and LImited Non Pro. Cindi Smart-Zeigler, riding her Doctor Pepper to the Novice Horse Non Pro victory. In the Rookie Division, Dee Allen was a hit with her Twogunsarebetter, winning championships in the L1, L2 and Prime Time rookie divisions. 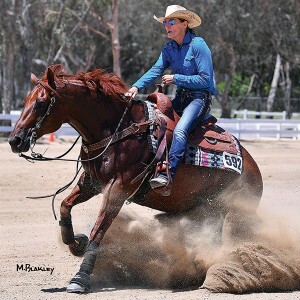 Mary “Riley” Cachat rode her Dun Its Legacy to the Youth 13-under Championship, and Alondra Sosa rode Luis Torres’s Smokin Montana Baby to the Youth 14-18 Championship. In the Open Division, Tom Foran captured the Novice Horse title on Robert Hutcherson’s Check Your Gun Lad, while Daphne Foran won the Open Championship on Gail Hutcherson’s Wimpys Whiz Steps. The Limited Open Championship belonged to Roslyn Proffer riding A Diamond Shy, owned by Robert Holloway. Next up on the CRHA schedule will be The Challenge on Oct. 24–28 at the Los Angeles Equestrian Center.